If there’s one thing that you put on your Baby Shower list, make sure it’s a LapBaby. Revolutionising parenting, making those early years easier, the LapBaby offers hands-free parenting without sacrificing baby contact or interaction. 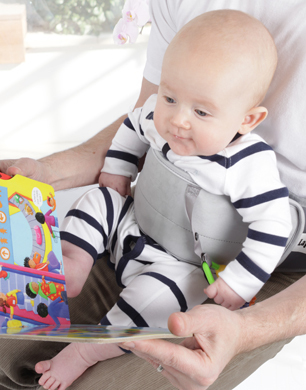 Designed to keep baby safe and secure whilst seated on the lap, LapBaby allows parents to carry on with everyday tasks such as mealtimes and emails etc whilst ensuring little one is involved with all the action. Perfect for the multitasking mum or dad, LapBaby offers a modern solution to parents working from home, travelling or for those times when you need to socialise with friends. Created for babies aged 3+, LapBaby also includes a strap attachment to ensure your baby’s precious teether or soother is at hand as well as a wipe-clean and detachable lap protector (great to ensure both baby and parent are kept clean). Produced in a neutral colour way for unisex appeal, LapBaby retails at £24.99.